Smart Mobile Tele-Clinic solution meets the advanced healthcare cutting edge technology in real-time telecommunication of primary care diagnosis and treatment covering the entire fundamental diagnostic procedures, instant spot lab diagnosis with digital radiology and ultrasound assessments. 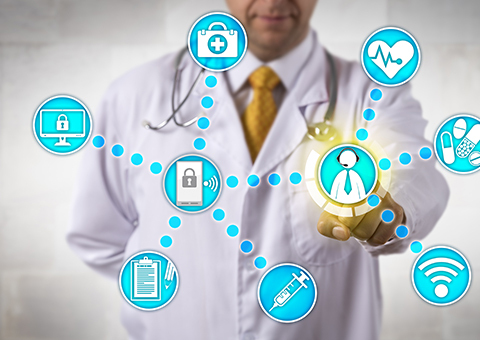 The integrated diagnosis is enabled with full and secure connectivity solutions to health care providers and healthcare bodies. 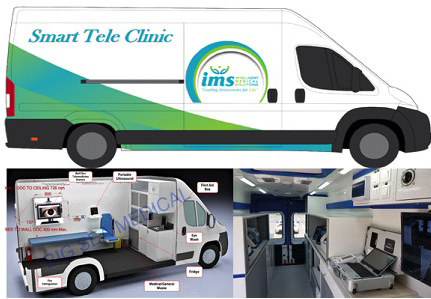 Smart Tele-Mobile Examination Unit is an innovative transportable modular design comprises of FDA certified clinical examination and diagnostic instruments, configurable to accommodate a wide array of examination capabilities. With the integrated video conferencing software and the connected medical devices, the Smart Tele-Mobile Examination Unit can share secure and accurate healthcare data with hospitals and healthcare providers. Smart mobile labs are uniquely designed to support the challenges faced by healthcare sectors. These products are tailored to provide on-site diagnostic solutions which enhances healthcare providers to receive on-the-spot tests results with certified validations from a reference lab. We bring the latest innovation in the field of Portable X- Ray, a unique solution that allows providing Diagnostic X- ray services in mobile healthcare services. Our Solutions are compact, and battery operated fused with a high-power generator system, which wirelessly delivers a superior image performance with impeccable reliability. We had also endorsed in our product portfolio the most advanced use of Point-Of-Care Ultrasonography. Our Smart POC Ultrasound Solution wirelessly pushes the boundaries of clinical care to overcome the limitations arising from remote areas or patient transfers. 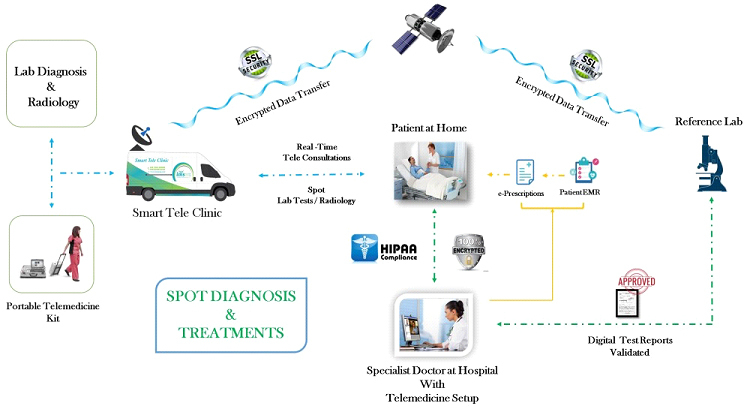 Smart Satellite Stationary Tele-Clinic solution utilizes the advanced tele-medicine technology and real-time telecommunication of Primary Health Care diagnosis and treatment covering the entire fundamental diagnostic procedures, instant spot lab diagnosis with digital radiology and ultrasound assessments. 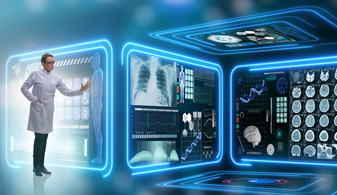 The integrated clinical examination and testing diagnosis is empowered with full and secure connectivity to health care centers and healthcare bodies. Smart Stationary Examination Unit is an innovative modular design comprises of FDA certified clinical examination and diagnostic instruments, configurable to accommodate a wide array of examination capabilities. Smart Stationary Examination Unit is empowered by an integrated video conferencing software and the connected medical devices to share secure and accurate healthcare data with hospitals and healthcare providers. Smart Stationary Lab includes small benchtop certified high-tech auto- analyzers utilizing the latest available technology to yield accurate and reliable results. These products are tailored to provide on-site diagnostic tests validated by a reference lab. We had also endorsed in our product portfolio the most advanced use of Point-Of-Care Ultrasonography. Smart ambulance is a new trend of ambulatory healthcare services utilizing advanced critical care instrumentation in combination with tele-medicine to help in life rescue and provide safe patient transportation. Our Smart Ambulances are empowered with highly secured connectivity systems that can integrate into any hospital HIS system; thus, whilst patient transportation the critical care procedures are instructed and monitored by the hospital ER medical specialists. With the Rapid changes in technology over the last few decades, telemedicine has transformed into a complex integrated service used in hospitals, homes, clinics, and other healthcare facilities. Our integrated telemedicine solutions utilize the most advanced information and communication technologies for the exchange of valid information for diagnosis, treatment and prevention of diseases. Smart tele-medicine will also play a significant role in the research and development of the health-care industry. Our Smart tele-medicine solutions are HIPPA compliant and are customized following the client needs, meeting the international standards and local regulations.